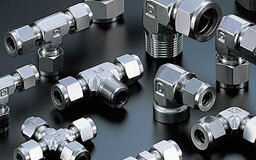 Stainless Steel Ferrule Fittings Manufacturer, Steel Instrumentation Fittings Supplier, Double Ferrule Tube Fittings Exporter in India. Our range of Ferrule Fittings and Instrumentation Fittings are available in Compression Tube Fittings, Ferrule Pipe Fittings, Double Ferrule Fittings, Twin Ferrule Fittings, Elbow, Tee, Reducer, Adapter, Plug, Tube Cap, etc. The products we offer are developed under the supervision of experienced quality controllers in accordance with the norms and guidelines. 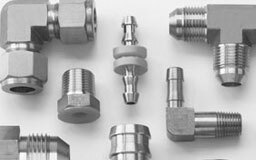 Moreover, we can also provide custom-built ferrule fittings and instrumentation fittings as per the specifications provided by customers. The quality product offered by us finds its extensive application in securing glass panels, city construction projects and other structure-enhancing projects. This ferrule fittings is essential to both domestic & public construction projects as it is the main component of the structure. 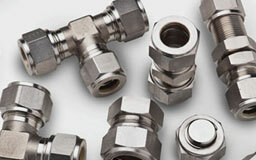 SS Ferrule Fittings, Double / Single Ferrule Fittings, Elbow, Tee, Plug, Compression Tube Fittings, Steel Instrumentation Fittings, Stainless Steel Double Ferrule Fittings Manufacturer in India. Carbon Steel Ferrule Fittings, Double & Twin Ferrule Fittings, Alloy Steel Instrumentation Fittings, Nickel Alloy Ferrule Fittings Supplier & Exporter in India. Dubai, Israel, United States, Pretoria, Lagos, Indonesia, Italy, Uganda, Dar es Salaam, Ouagadougou, Algiers, Colombia, Accra, Kano, Abidjan, Yaoundé, Brazil, Peru, Johannesburg, Kazakhstan, Cameroon, Argentina, Benin, Lubumbashi, Colombo, Bamako, Tunisia, Zaria, Democratic Republic of the Congo, Malaysia, Vietnam, Durban, Trinidad and Tobago, Kolwezi, Australia, Port Elizabeth, Turkey, Ghana, Iraq, Ibadan, Soweto, Canada, Venezuela, Freetown, Ethiopa, London, Jordan, Omdurman, Cairo, Rabat, Kaduna, Saudi Arabia, Alexandria, Chine, Mozambique, Mogadishu, New Zealand, Egypt, Tripoli, Dakar, Harare, Luanda, Kuwait, UK, Douala, Thailand (Bangkok), South Africa, Conakry, New York, Kinshasa, Cyprus, Singapore, Nigeria, Lebanon, Oman, Fez, Khartoum, Azerbaijan, Bulawayo, Kampala, Cape Town, Maiduguri, Qatar, Bahrain, Port Harcourt, Algeria, UAE, Giza, Abu Dhabi, Mexico, Germany, Africa, Hong Kong, Maputo, Casablanca, Sudan, Brazzaville, Russia, Iran, Angola, Antananarivo, Houston, Mbuji-Mayi, Morocco, Addis Ababa, Yemen, Subra al-Haymah, Nairobi, Sri Lanka. Buxar, Tadepalligudem, Durban, Ballia, Luanda, Muktsar, Bangalore, Subra al-Haymah, Lagos, Benin, Mogadishu, Nairobi, Algiers, Zaria, Bhiwadi, Lucknow, Cairo, Maiduguri, Abidjan, Freetown, Harare, Johannesburg, Casablanca, Port Elizabeth, Antananarivo, Ambala, Lebanon, Udgir, Pune, Yemen, Abu Dhabi, Rabat, Bundi, Algeria, Venezuela, Jaipur, Andhra Pradesh, Suryapet, Bulawayo, Mumbai, Bamako, Addis Ababa, Khartoum, Qatar, Bansberia, Tripura, New York, Democratic Republic of the Congo, Kano, Dakar, Tripoli, Sadar, Accra, Yaoundé, Cyprus, Baraut, Ghana, Alexandria, Surat, Kolwezi, Giza, Lubumbashi, Dar es Salaam, Kampala, Ibadan, Puducherry, Russia, Miryalaguda, Angola, Manipur, Colombo, Jordan, Conakry, Ethiopa, Brazzaville, Betul, Hong Kong, Mbuji-Mayi, India, Chennai, Mozambique, Cape Town, Maharashtra, Kaduna, Jamalpur, Port Harcourt, Singapore, Hyderabad, Benin, Omdurman, Kolkata, Oman, Kinshasa, Ahmedabad, Nagapattinam, Morocco, Douala, Mizoram, Soweto, Kerala, Maputo, Pretoria, Fez, Cameroon, Thailand (Bangkok), Ouagadougou, Karnataka, Delhi, Uganda.